Cut tops off of bell peppers, saving the tops. Scrape out membranes and seeds. Mix meat, onion, about ¾ of the tomatoes, rice, Worcestershire, basil or oregano, and half of the cheese. Spoon meat mixture into the bell peppers, filling to the top. Place peppers in the slow cooker, standing up. Pour water into the bottom of the slow cooker, to keep the peppers moist. Dump the rest of the tomatoes on top of the peppers. Place tops back on peppers, like cute little jaunty hats. Cover and cook on high 4-5 hours or on low 7-8 hours, or until rice and meat are cooked thoroughly. About 10 minutes before serving, remove pepper tops and sprinkle remaining ½ cup cheese on top of meat mixture. Let cheese melt, and enjoy! We enjoyed this one. I have never stuffed peppers with raw meat and uncooked rice before, but it worked beautifully! 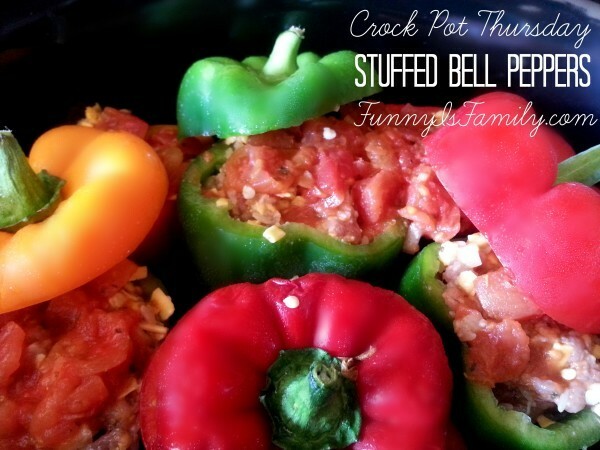 This was by far the simplest stuffed pepper recipe I've done, and it tasted great. The flavors were simple and well-balanced, and the leftovers were tasty. Another make again! These were great. We used beef but seasoned it to give it a little more flavor. Will make again! I really liked these peppers. My husband said they weren't even in the same ballpark as my usual recipe, and thought the peppers had a bitter taste. He's wrong, but it was fine because I got to eat all the leftovers. I always use sausage in my stuffed peppers, and you should, too.